You might credit Dave Rawlings' signature fast-and-flat picking style to an encyclopedic knowledge of the guitar greats, or to a natural affinity for the instrument. Perhaps even to his Berklee degree. They're all safe bets, but, as he jokes to Jackie Greene in the second installment of D'Addario's Guitar Power acoustic series, he might actually owe his chops to something a little less intellectual. "My hand-eye coordination was pretty good, I am pretty sure, because of video games," Rawlings tells Greene about his early days at the guitar, which he only picked up after a friend demanded the two play Neil Young's "Heart of Gold" for the school talent show. They were 16: Rawlings had his parents buy him a "little tiny Harmony" from the local Save Right, and started teaching himself through a set of Mel Bay instructional books. Still, he couldn't quite hone in on that iconic "Heart of Gold" riff. "There's so much noise! How do you make all that noise?" the creative partner to Gillian Welch recalls to Greene, seated at an East Nashville studio in head-to-toe denim and a white cowboy hat. He took to the instrument pretty quickly, but had only yet mastered "single note stuff." "No one had ever showed me a chord," he says. "In some ways, that shaped my guitar playing." 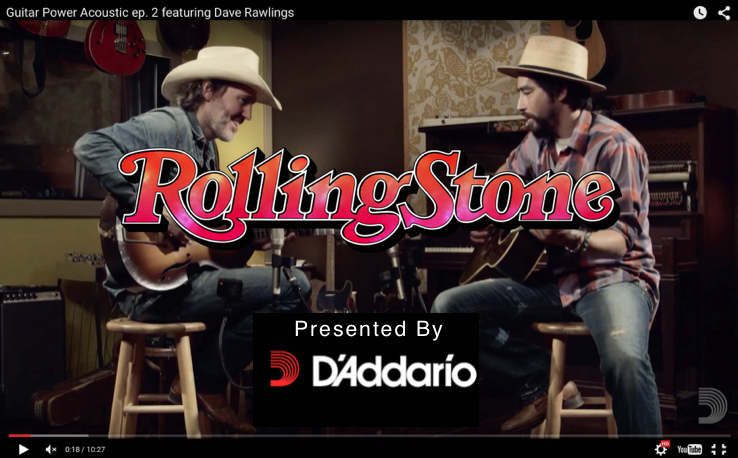 Wielding his unmistakable 1935 Epiphone archtop, Rawlings showcases a little of that improvisational, single-note-driven playing, riffing off his recent sophomore release as Dave Rawlings Machine, Nashville Obsolete. The songwriter is almost never seen with any other instrument, and, as it turns out, it wasn't a purchase from some luxury vintage guitar shop — it was scavenged from the dirt of a friend's attic. "I just picked it up. It was filthy, and it didn't have strings," he says. "You could just see the shape of it under the sawdust." Rawlings took it home, tuned it up and brought it to the recording session for the first Gillian Welch record, Revival. It was the last instrument he tried in the studio, but he's barely put it down since. "As soon as I heard it through the microphone and through the speakers I was like, 'I love this guitar.'" Future installments of the D'Addario Guitar Power series include guests Chance McCoy from Old Crow Medicine Show and Sean Watkins of Nickel Creek.